Hannah was an award-winning financial advisor who had been wondering whether she was the right person to run the CAP Centre that Gillingham Community Church had been longing to start. Reading an Inspire article about the debt counselling charity CAP led to a visit to their head office in Bradford. At the end of that trip she and her husband Steve knew this was what God wanted her to do. “My heart was breaking for those I heard about,” says Hannah. 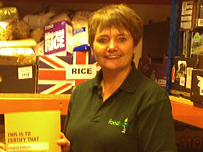 In 2008 she helped to set up Gillingham CAP Centre, which has gone on to assist more than 400 people. One of their recent clients who had retired with a lump sum pension, discovered that his brother, whom he had asked to pay his bills for him online, had instead gambled it all away. He had also taken seven payday loans in his name. “After challenging him about this, our client’s brother committed suicide and he had to pay for his funeral,” explains Hannah. “He was at the point of having a mental breakdown after all he had suffered. Hannah, who has also helped form First Dorset Credit Union, got together a team to run Gillingham Food Bank, and this year spearheaded the development of a drop-in cafe called Open Door. She says she wouldn’t want to “just sort the finances and leave [people] in a mess in other areas”. Introducing clients to the church and to Jesus is “the whole package”. There's still time for you to nominate your unsung hero for a 2013 Inspire Award – just fill in the form HERE. Closing date for entries is 16 September 2013.